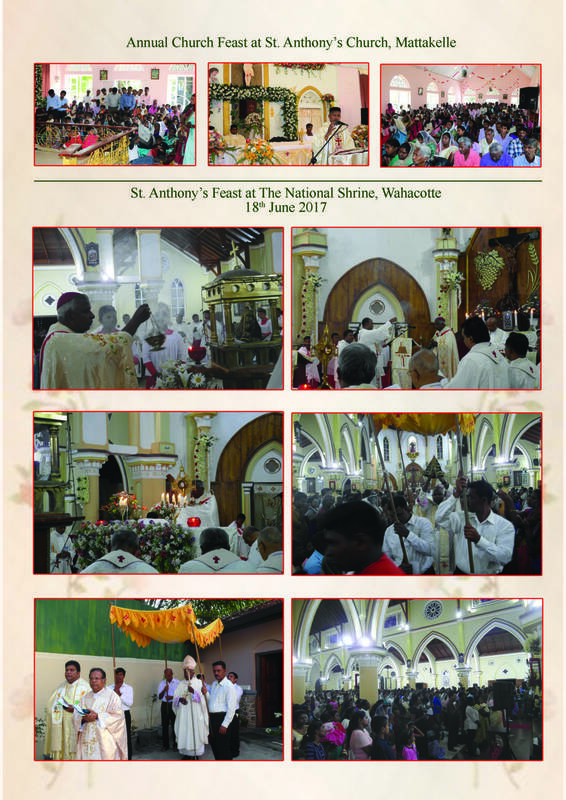 Practically half the year dedicated to St. Joseph Vaz is over. 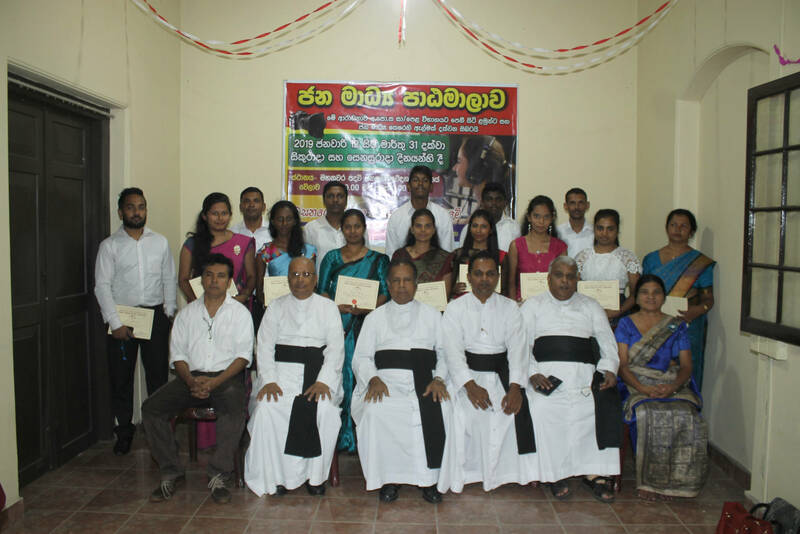 While I wish to thank you for all the parish level programmes you are implementing to achieve the objectives of this year, we also need to focus on our own priestly life and ministry to emulate the wonderful example of this unparalleled missionary, St. Joseph Vaz. As we discussed at our last monthly recollection we have to strive towards holiness as priests and be zealous shepherds to our flock. 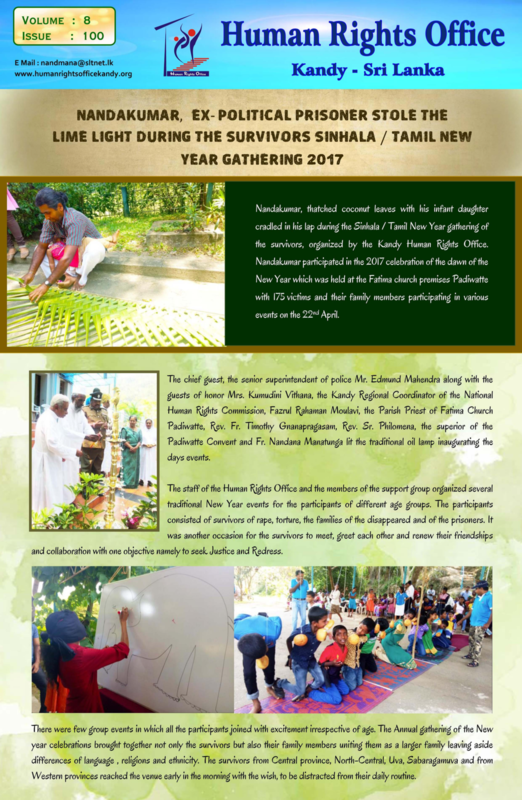 St. Joseph Vaz’s spirituality and missionary labours are inseparable. Burning with zeal for souls he rooted his missionary labours in profound prayer and asceticism. His simplicity of life and shining example of priestly virtues endeared him to the scattered flock during the persecution. No wonder that they called him “Angelic Priest” (Sammanasu Swami). The now famous phrase of our Holy Father Pope Francis that a good shepherd must be familiar “with the smell of the sheep” was so true of St. Joseph Vaz. He lived among the people, loved them and was close to them in his life style and ministry. If are to be loving shepherds to our flock, we need to know each and everyone in our parishes and institutions personally. This is very true specially of the poor, the sick and the suffering. If we are contented by being in our mission houses and celebrating the Sacraments only, our lives must change in accordance with the life of our Apostle. During the year dedicated to Consecrated Life, the Holy Father in his letter explicitly mentioned that the biggest discrimination of our people is to deprive them of spiritual ministry. Therefore, we need to do much soul searching as we come to know the indefatigable missionary labours of St. Joseph Vaz with no infrastructure facilities or other amenities that we enjoy today. Our accountability as shepherds has to be taken seriously. What was said in earlier times in beautiful Latin “Qualis Sacerdos, talis populus”, namely what the priest is, the people will be is true. If we are not striving for holiness through personal prayer and renunciation, combined with simplicity of life we cannot achieve the objectives of the year dedicated to St. Joseph Vaz. 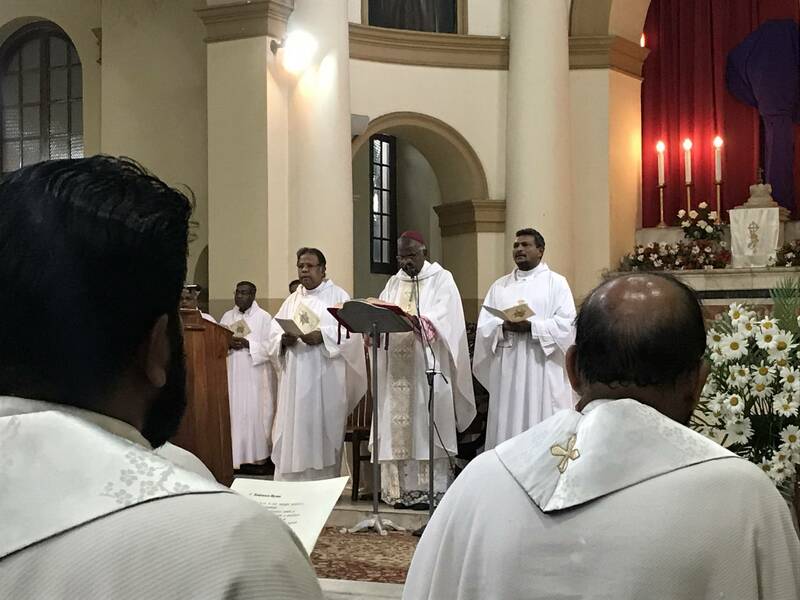 Let us say the prayer of St. Joseph Vaz at the end of Holy Mass with meaning and fervor, asking the Lord “to inspire” all of us, Clergy, Religious and the lay faithful to follow his example of heroic sanctity that the whole community can be fervent missionaries. We need to commit ourselves to make our families as the Holy Family of Nazareth. We are happy to welcome Fr. Dominic Sandanam after his Master’s Degree in Chennai University. He will assume duties with effect from 1st of July as the Rector/Principal of St. Patrick’s School, Talawakelle. The Presbyterium and the Bishop wish him God’s blessings in his new responsibilities. We shall miss Fr. Marian Leonard who has been a very committed priest co-worker. However, we are very happy to release him for the work at the Apostolic Nunciature. Please convey our sincere thanks to all the parishioners who contributed to the “Little Hearts Project” during the Season of Lent. We shall handover to the relevant association the fund collected. 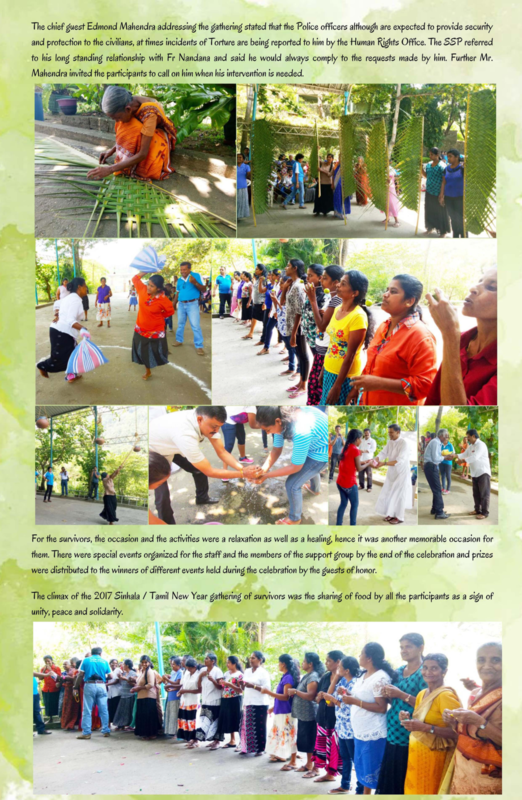 Please help our Formation Coordinator Fr. Colvin Fernandopulle when he requests your assistance for the holiday programme for the major vacation of our seminarians. We, as the presbyterium and the diocese are responsible for their formation during the major vacation. 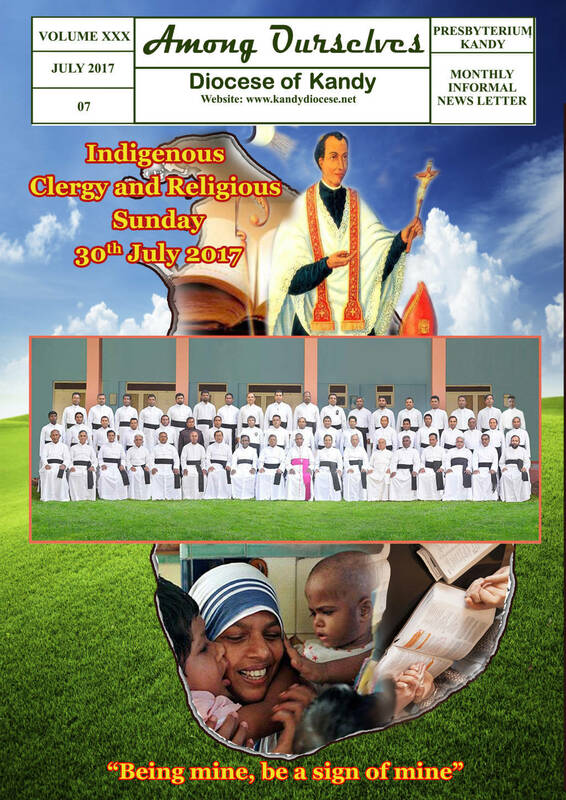 Please do everything possible to organize the Indigenous Clergy Day which falls on the 30th of July in a meaningful manner in all the parishes and the institutions. Wishing all of you God’s blessings! 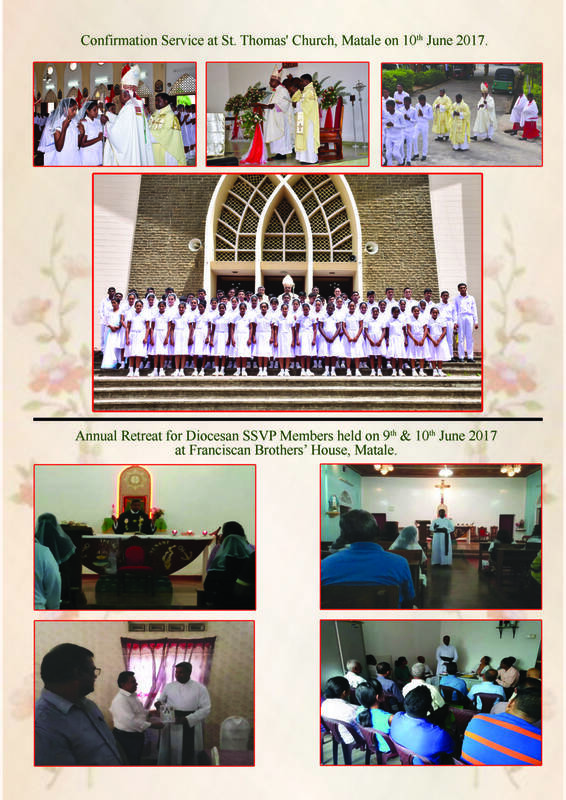 3rd – 5th – 1st Symposium on St. Joseph Vaz in Lewella. Nuwara Eliya from 9.00 am to 3.30 pm. Pope Francis’s emphasis on simplicity and frugality is a hit all around the world, but it’s produced just a bit of backlash among fashion-conscious Italians, including an exclusive club of tailors and shoemakers who outfit pontiffs — some of whom are a little nostalgic for the days when being pope also meant dressing to the nines. An exclusive group of tailors and cobblers who cater to the Vatican are slowly adapting to Pope Francis’s penchant for simple and plain clothing, which has inspired a demand for more practical and comfortable frocks from clergy around the world. The Argentinian pope’s call for a Church that is dynamic and “on the move” has translated into a preference for religious clothing reflecting that zeal, and is no longer constrained by heavy fabrics and embellishments. “Maybe once we were a bit excessive, and now slowly…” said Raniero Mancinelli, who has been a tailor for the clergy and popes for decades, in an interview with Crux. Popes through history have always been fashion trendsetters, since they exercise influence over a vast community and their choice of jewelry and clothing often says a lot about the mission and message of the pontificate. The past three “foreign popes,” meaning not from Italy, took a unique approach to classic papal style, and, sharing an astute grasp of the media, have left us with iconic images that will last for the ages. No one could rock a cape like Pope John Paul II, and pictures showing his red mantle billowing in the wind, or gently wrapped around children, have left a lasting impression on Christian and secular culture. Emeritus Pope Benedict XVI, a European, dusted off the classic papal staples and ushered them into the new millennium with his unique sense of style. Francis’s preference for ‘papal athleisure,’ meanwhile, has already begun to leave its mark on history. In a small shop on the Borgo Pio, a picturesque street next door to the Vatican, Raniero Mancinelli slices away at fabric on the counter, scarlet and black scraps falling to the ground with every cut of his scissors. Over his head, etched in wood is his name and the date the shop was opened: 1962. Mancinelli has been in the business of dressing popes for a long time, and therefore has had a front-row seat to the changes that occurred in religious garb from the Second Vatican Council (1962-1965) to this day. “It’s not as if before the clothes were more luxurious or pricey, maybe a bit more flashy and rich with details,” Mancinelli said. “Today this has changed a bit. Now with Pope Francis’s direction, people want things that are much lighter, simpler and more sober…. and consequently less expensive.” As an example, the veteran tailor said that the cross usually worn by bishops and cardinals used to be adorned with gems and gold plating. “Now these are more popular,” he said pointing to plain crosses made of metal and wood. A quick look at the tags shows a significant difference in price. Asked if this pope is not very good for his business, Mancinelli laughed. “Yes… a bit,” he said, because the demand has diminished and the clothes are less costly. “A double loss, in a sense. “It’s not a question of agreeing. One accepts this manner he has of doing things in a simpler fashion,” Mancinelli said. But the tailor is not saddened by the change, though he admits that, to him, religious clothing has become a little plain. “Maybe too plain compared to how they were before,” he added. Mancinelli started his business just as the Church underwent a profound revolution. He was there when Pope Paul VI eliminated the train that cardinals used to wear, which could be up to seven meters long. He spoke of a time when “a crease could not be ignored,” while today anything is acceptable. Pope Francis’s torn-up sleeve as he returned from a visit to the beach town of Ostia, for instance, took over the Internet in 2013. “His vestment is very simple, he has had it for a long time,” Mancinelli said, adding that white is a very sensitive color and, by being in close contact with so many people, is susceptible to being ruined. “I don’t exclude the possibility that in the evening he just puts it to wash, and wears it again the next morning,” he sighed. Pope Francis also chose to have a smaller sash that is not made of silk, and breaking with tradition he refused to have his emblem etched on it. Mancinelli admits that having grown up in a different time, he has a preference for things that are well-fitted and precise, but he also recognizes that “if the pope decided to take this position, it means that there is a reason. “Maybe now we can concentrate more on the will of God instead of men,” he added. The two main things to keep in mind when working for the pope, he said, are discretion and adaptability. Mancinelli had a good relationship with Pope Benedict XVI. He “used vestments that were a bit more beautiful, let’s say, in the sense that they were more beautiful to look at,” he said. Now, clergy from around the world ask Mancinelli for Pope Francis-inspired cassocks, ready for the daily wear and tear. But this new style has its advantages when it comes to time consumption. Silk takes much more time to sow, and the simpler fabrics mean less time to make the clothes, he said. Any Italian will tell you that one key to a good look is a fine pair of shoes. Footwear is not taken lightly in the Bel Paese, and a poor choice is guaranteed to provoke criticism and directions to some cousin who can fix you up. Pope Benedict XVI knew the importance of a good pair of shoes, and his custom-made red slippers became a trademark of his style and even earned him the title of ‘Best Accessorizer of the Year’ by Esquire magazine in 2007. Gossip ran wild with who might be the maker of the ruby-colored papal slippers, with some claiming that they were made by the Italian fashion powerhouse Prada. But in 2005 the rumors were finally put to rest when the a cobbler from a small town in northern Italy presented Pope Benedict XVI with the shoes for all the world to see during a general audience at St. Peter’s Square. “Dressed in white with that red shoe… it really catches the eye!” Adriano Stefanelli, a cobbler and the creator of the famous slippers, told Crux in a phone interview. “When it comes to clothes and such things he is a very, very elegant person,” Stefanelli said about the emeritus pope, adding proudly that “the peak of his splendor” took place when he first wore the red shoes. Stefanelli prepared six shoes in total for the German pope throughout his pontificate. He was commissioned by the Vatican for the first time in late 2013, but the high-ranking client was not satisfied with the order. Stefanelli had made the shoes in claret, the color preferred by the now-saint John Paul II, but the demand was clear: They had to be red. “During his pontificate I received requests from all over the world for the same slipper, some wanted it red, others black,” Stefanelli said, citing among the buyers the former president of the United States, George Bush, for whom he made an identical pair in black. Stefanelli denies being hurt by the pope choosing not to wear his flamboyant slippers. “Every man has his style,” he said. He began his career as a papal cobbler by gifting a pair of shoes to Pope John Paul II, who preferred them to be dark brown and was so pleased with them that he became a regular client. “Pope Wojtyla is kind of similar to Pope Francis. Maybe Pope Wojtyla was slightly more refined, while Pope Francis views clothing and style in a very humble way,” Stefanelli added.